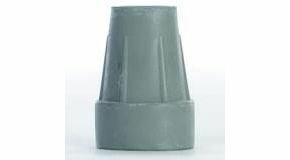 Ferrules-Grey Heavy Duty (Pair) Various Sizes. These ferrules have circular grooves on the base for extra grip and a steel washer insert. Item as described & they arrived quickly. Excellent - very quick delivery and they do the job perfectly - zimmerframe no longs chews up the carpet! Great quality, feels safer when walking. Fast delivery at a good price.